The award-winning Whitworth Jazz Ensemble recently returned to Spokane after a successful tour of New York City and New Orleans Jan. 9-20. Highlights of the tour included performing with jazz legend Lee Konitz and well-regarded jazz musicians Donny McCaslin, Ryan Keberle and Larry Panella. In addition to performing, the ensemble also enjoyed going to jazz concerts at clubs in both cities, including the Maria Schneider Big Band at Birdland; Chris Potter and the Village Vanguard Big Band at the Village Vanguard; the Pedro Giraudo Band at Jazz Gallery; and Ellis Marsalis at New Orleans' Snug Harbor. They also sat in on a four-hour rehearsal of the Lincoln Jazz Center Orchestra. The ensemble conducts a national or international tour bi-annually. In January 2008 and 2004 they traveled to Rome for several performances with leading Italian jazz artists, followed by a performance trip to Hawaii in March. In 2006 they traveled to Sao Paolo and Salvador, Brazil, for concerts at music festivals. Other performance residencies have included a trip to Havana, two trips to Munich, and four trips to Rome, as well as nine performances at the Melbourne (Australia) International Jazz Festival and in the surrounding area. The Whitworth Jazz Ensemble is one component of the jazz studies program at Whitworth University. 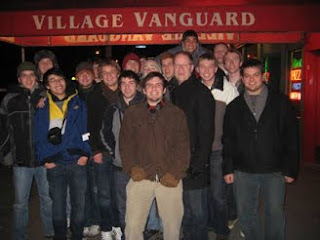 The Whitworth ensemble was the winning band in the college/university division at the 2008, 2004, 2002, 1999, 1998, 1997, and 1994 Lionel Hampton Jazz Festivals (finishing second in 2007, 2006, 2005, 2003, 2001 and 2000), and has been selected from colleges and universities in the six Northwest states to perform at seven All-Northwest and All-State Music Educators Conferences, including those in 2007and 2008. Whitworth’s program has been listed in Jazz Times magazine as one of the top jazz-education programs in the country. The 18-piece Whitworth Jazz Ensemble performs several concerts each year on campus, as well as at jazz festivals, in public schools, at civic events, and on annual tours throughout the United States. Over the past decade the ensemble has performed in standing-room-only concerts with guest artists Lee Konitz, Terence Blanchard, Robin Eubanks, Kenny Garrett, Eric Reed, Nicholas Payton, Jimmy Heath, Byron Stripling, Bob Mintzer, Joe Lovano, Randy Brecker, Phil Woods, Steve Turre, Slide Hampton, Carl Fontana, Marshal Royal, Bill Berry, Roberto Gatto, and Enrico Pieranunzi. Dan Keberle, professor of music and director of the jazz ensemble, Whitworth University, (509) 777-4582 or dkeberle@whitworth.edu.